Yahya and Siba fled Syria in 2013, with their infant daughter. They lived in Jordan for 3 years, awaiting refugee resettlement status and welcoming a son. 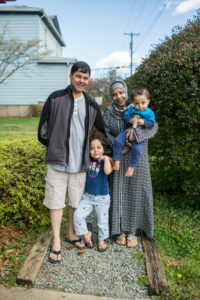 Now, the family of four lives in Charlottesville, VA and is “happy to be able to work and to be safe.” IN programs: Family Friendship, Bilingual Buddies Thanks to International Neighbors and the Montessori School of Charlottesville, Hend (4 years) is able to attend preschool where she excels at learning English and making friends.